Are you a mum working for a non-profit? Interested in upskilling with salesforce skills? About a quarter of our trainees are currently working within a non-profit already and they decide to upskill themselves in Salesforce to help implement Salesforce at the charity they work, whilst also looking at other Salesforce opportunities to increase their hours and salary. 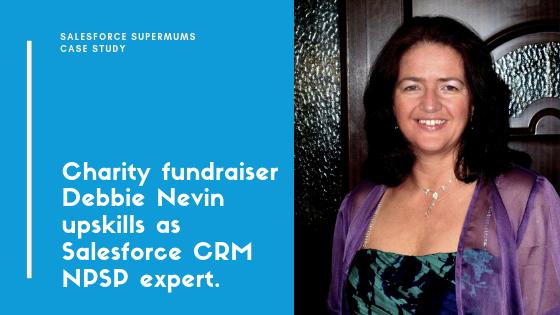 Salesforce Supermum Debbie Nevin shares her story about how and why she decided to embark on the salesforce journey. What did you do before the course? I’m currently a part-time Fundraiser for a small charity in Gloucester, I wanted to reduce my hours when I had my daughter in 2011 so I could spend time with her. Before that I was a Software Support Manager, supporting Donor Strategy software for charities. I arrived there from several analyst/programmer type roles over the years. I have over 16 years experience in the software industry, over 10 of those in software for charities. Why did you choose to retrain in Salesforce? I loved being able to help clients make the most of the software available for them, importing data and using powerful reporting tools, supporting them in getting a clearer picture of their business and in being more efficient. I heard about Salesforce several years ago when my former boss talked about a podcast by Tien Tzuo for Stanford Entrepreneurial Thought Leaders, then again around 5 years ago when a former colleague went to work for a consultancy implementing systems. I briefly considered using it at the charity I work at, but found it was too complex to implement myself without learning first. I knew it had become a market leader over the years and that they now have the NPSP for charities as well as the Power of Us programme, donating free licences to small charities. What attracted you to the Salesforce Supermums course? When I discovered the Supermums programme it seemed to be a sign to retrain in Salesforce and use my technical skills alongside my fundraising skills. The fact that the training also included a chance for work experience on a live project as well as links with an organisation that will help me find flexible work after made for a very attractive package. What difference did the work experience and mentoring make to your learning? Putting learning into practice with work experience helped reinforce learning. By applying theories in a practical way they make more sense. Studying with mentors who have vast experience of Salesforce helped give confidence in learning. What guidance would you now give others who are considering a career in salesforce? There is a lot of opportunity for work in Salesforce and a chance for flexible working if that is what you seek. There is also a wide variety of roles to fulfil. The online training available for continual development is outstanding. I am in the process of implementing the system for the charity I work for – something I did not feel confident doing before the training and would not have attempted. This is saving our small charity thousands. There is still a long way to go but this practical experience of the system is also a great reinforcement of my learning. I only work part-time and so I am hoping to find flexible work to fill the hours available after I have passed the Salesforce Administrators exam. I foresee a great opportunity to find more technical roles and develop my career as I find more time available as my daughter grows and needs me less. Would you recommend this programme to others if yes, why? I would highly recommend the programme to anyone considering a career in Salesforce. It is a great grounding in the software and also the skills needed to implement and manage systems. The Supermums programme also gives practical work experience which helps give confidence that you can apply the learning ready for when you get a job. The support of the team in both the webinars and the practical project are invaluable. There is a great encouragement to stick with the programme and not give up. Ready To Start Your Learning and Journey Into A Career in the Salesforce Ecosystem? The next cohort for our Salesforce Supermums training programme starts on the 5th November. You can find out more about the programme here. This entry was posted in Careers, Case Study, Salesforce, Training and tagged career, nonprofit, retraining, Salesforce Supermums.